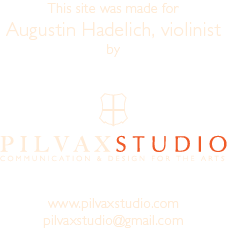 It would be very easy to love Augustin Hadelich's violin playing simply for his crystalline technical facility or his always-interesting singing sound, but I am partial to his long and deep sense of phrase, his sensual relationship to the pitches that really ring on his instrument, and his fresh approach to Haydn. There is something about his playing that excites my "inner violinist" (something that always seems to be at odds from my "outer violinist") in a way that no other violinist excites it. There is something unique about his playing: perhaps a purity of intent or a direct line to what is essential in music. It is difficult to describe, but it is easy to recognize. He is able to let phrases soar in the air, making great and graceful arcs; and then he lets them land lightly, yet decisively. Hearing him play Haydn makes me happy—not a giddy kind of happy, but a balanced kind of happy. While the music is playing, I have a feeling that all is right with the world. This recording is one of his prizes for winning the 2006 International Violin Competition of Indianapolis. Another prize is the use for four years of the ex-Gingold Stradivarius, the instrument that he plays here. Each component of the trio of Haydn, Hadelich, and Stradivari brings out the best in the others, and Hadelich's stunningly-beautiful cadenzas reflect (and sometimes even improve on) the best moments in these concertos. I am impressed that he chose these three Haydn concertos for his Naxos recording. Even though they are extremely difficult to play they do not appear virtuosic to the non-violinist. Aside from the First Concerto in C, these works are not very popular. Violinists and people who play with violinists know that they all require a tremendous amount of musicianship and technical strength to play well, and they also demand an excellent accompanying orchestra, which Hadelich has in Helmm Muller-Bruhl and the Cologne Chamber Orchestra. 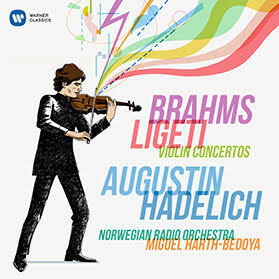 After hearing this recording you will agree with me that the future of great violin playing is safe and very bright in Augustin Hadelich' 24-year-old hands.